I love plants of all types. Fruits and veggies, flowers, and greenery are all my favorites. I was raised around plants and have them all over my house and yard now. I do know a lot about plants but I also feel you are never to old or to good to learn more, and I did learn more. 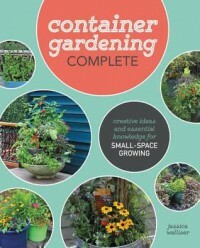 This book is packed full of information and tips on Container Gardening. It will teach you how to choose the right size and type of pot, how to get your drainage correct, and so much more. I loved everything about this book. I really loved the sections on mixed plants in the same pot. I love when puts are filled with different types of plants. but I usually end up putting in at least one pot that over grows or root system takes up to much room, or needs more water then the other plants in the pot and they do not do well. With this book I can now solve that problem. With Spring almost here I am excited to get started on my house, porch, and yard plants.